Is complete right cervical paraesophageal lymph node dissection possible in the prone position during thoracoscopic esophagectomy? Effective treatment of esophageal cancer requires dissection of the regional lymph nodes (LNs) from the cervical to the abdominal area. In this study, we hypothesized that adequate no. 101R dissection is achieved through a thoracoscopic approach in the prone position. 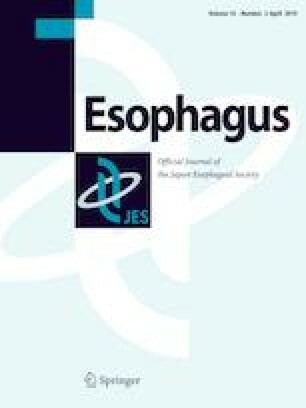 The study cohort was limited to 42 patients who underwent thoracoscopic subtotal esophagectomy with bilateral cervical lymphadenectomy for thoracic esophageal cancer between January 2015 and March 2017. The number of LNs and the incidence of metastasis were analyzed. During the proposed thoracoscopic procedure, cervical paraesophageal LNs were dissected continuously, with the LNs surrounding the recurrent laryngeal nerve (RLN; no. 106rec) as an en bloc resection. In this study, LNs that required further picking up via a cervical incision were defined as no. 101. The recurrent sites among the consecutive patients during the 3-year follow-up, for whom bilateral cervical lymphadenectomy was omitted for lower and middle thoracic tumors between 2012 and 2014, were analyzed further. The data of 42 patients were analyzed. The lymphatic tissues dorsal to the right cervical RLN were almost completely dissected via thoracoscopy. A median of 0 (0–6) LNs were ventral to the right RLN (no. 101R) and no LN metastasis was observed. There were no lymph nodes in 27 patients (64%). By contrast, there was a median of 1(0–10) no. 101L nodes, and LN metastasis was observed in two patients (4.7%). The numbers of LNs at no. 106recR and no. 106recL were 3 (0–9) and 2(0–13), respectively, and the corresponding numbers of patients with metastases at these sites were 11(26%) and 5(12%), respectively. Among the 33 patients who completed the 3-year follow-up, 9 patients developed recurrence, but none involved 101R LNs. There were no residual LNs in the area ventral to the right cervical RLN in 64% of the patients who underwent additional cervical lymphadenectomy after the right thoracoscopic approach in the prone position. Further studies with larger patient cohort or randomization are required to confirm our results. Drs. Yagi, Kanaya, Hosogi, Akagawa, Kawada, and Shimoike have no conflicts of interest or financial ties to disclose. This research received no specific grant from any funding agency in the public, commercial, or not-for-profit sectors. Informed consent or a substitute for it was obtained from all patients for being included in the study. It was also approved by the hospital ethics committee. Reception number is J-0009.